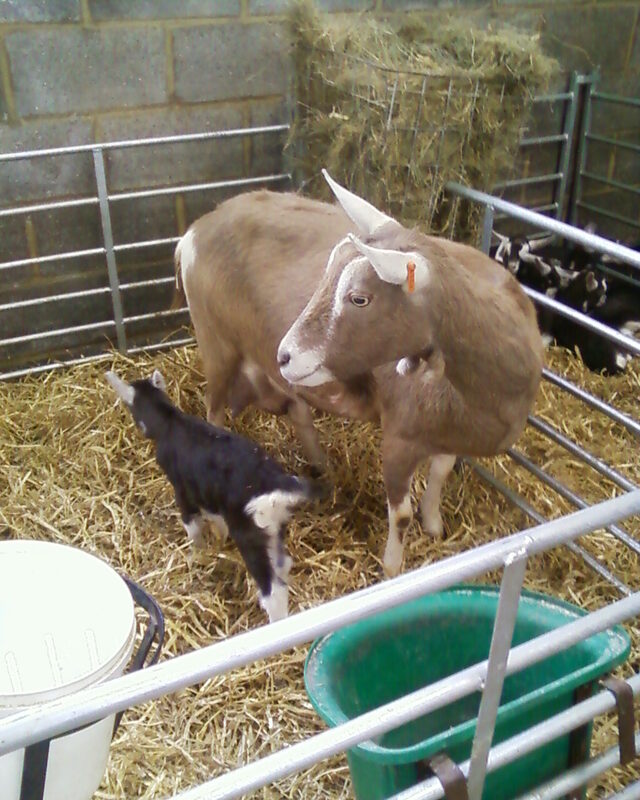 Shares, our show-jumping goat, gave birth to a strapping little lad on Sunday. 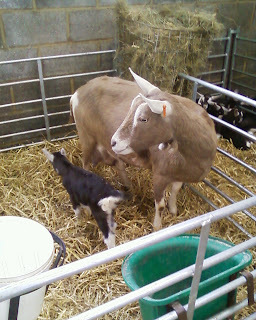 Typically, she is not happy being confined to a pen with her baby and so keeps jumping out for a wander around the barn. She chortles away to her baby and tries to encourage him to come out with her! But, as he can't get out, she is forced either to jump back in or to wait until we open the gate for her. But she is a good mum and is looking after her little chap very well. And then there was Flora. Remember Flora? Our big old girlie who had so much trouble with her legs last year that we decided not to put her in kid again and retire her from milking? Well .... not long after she had 'retired', a huge abscess formed on her bad leg. Eventually it burst and we spent several days cleaning and dressing it until it healed. 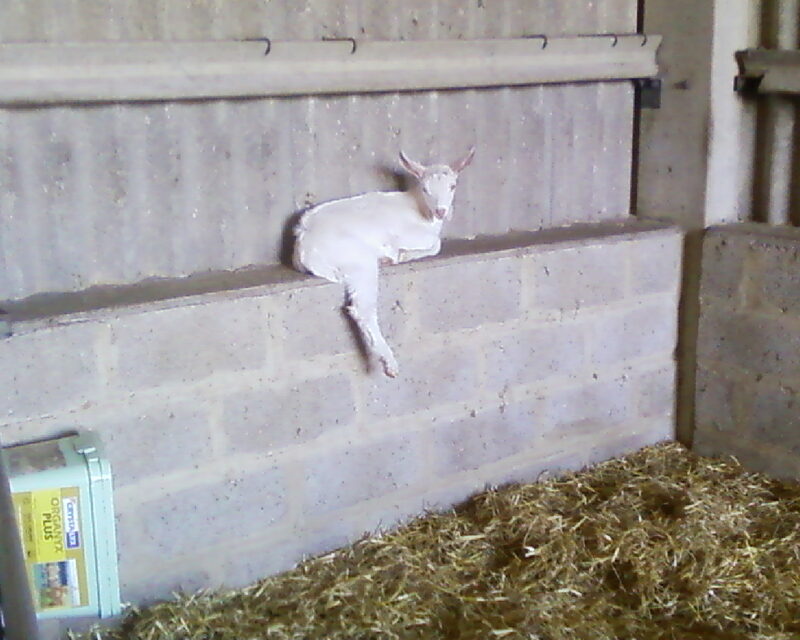 Strangely enough, once it had all cleared, Flora was like a new goat! She no longer walked with a limp and was bright and sprightly again. We think that she must have had something so deep in her leg that it had caused her problems for a couple of years. Eventually whatever it was had come to the surface and then disappeared! So, we decided to put her in kid once again as she seemed so much better. And, indeed, throughout this pregnancy she has been completely mobile and has not struggled at all, despite her rather enormous size. 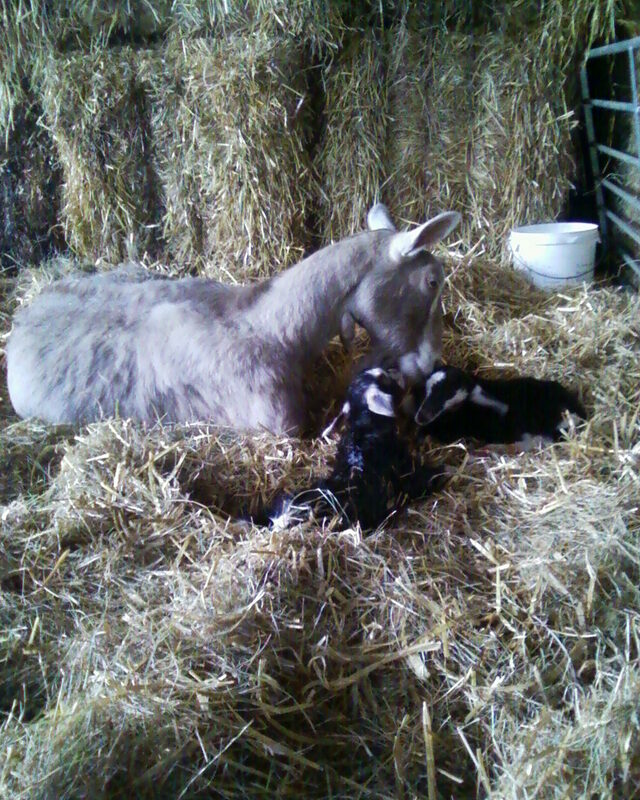 And yesterday afternoon, right in the middle of a marathon mucking out session when everyone was crowded into one side of the barn, Flora decided to go into labour. Typical Flora! Work was suspended and the tractor turned off whilst we moved her out into the hay barn where she had a lot more space and it was much quieter for her. Shortly afterwards, she had two bouncing baby boys. And she was up and about straight afterwards. So, in a few days, my lovely old girl will be back in the milking parlour. Dear old Flora! Of course, the nice weather over the past few days has meant that the goatie girls have been out and about in their field a lot more. However, they are enjoying it so much that they don't want to come in for evening milking. So David decided to try his goat herding skills with Ben doggie. 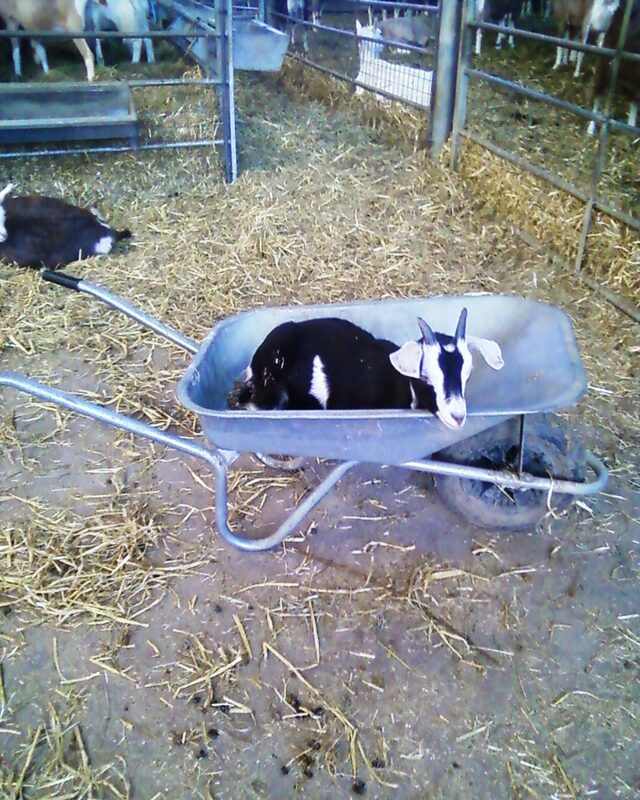 As you see, goats are not like sheep. They tend to run towards the dog rather than away from it as they are curious to find out what it is! But we got them all in eventually! She was very popular with everyone at the surgery and had a full tour of the practice as everyone wanted a cuddle! Oh.. YOU do write the most enchanting posts.. WE loved the photos of dog learning goat herding tricks.. hahaha.. but the prettiness of that little grey and white girly! Take lots of photos of her.. she could be a film Star! Joke not.. there are animals who are film stars! WE or rather SHE will see YOU at Balham on Saturday, please keep 4 pints for HER.